A literary showcase . . .
"Soul strategies" to guide your spiritual journey . . .
Embarking on the path of consciousness is perhaps the most important decision you will ever make. This process can increase happiness and inner peace while bringing your soul closer to the Divine—and as author Nozer Kanga makes clear, even the smallest steps carry you forward. Kanga reveals how small changes to daily actions, thoughts, and attitudes can have exponential effects on your spirituality and consciousness. These simple but profound “soul strategies” are invaluable for anyone seeking to understand the workings of the mind and offer effective solutions when life throws obstacles in the way of mindfulness and spiritual growth. A longtime student of consciousness, Kanga provides informed explanations of basic spiritual concepts, making Living with Consciousness an ideal primer for those newly embracing a more spiritual life, while his practical advice and personalized approach to consciousness make it equally valuable for those already on an enlightened path. Whether you choose to dip into Kanga’s advice for guidance on specific aspects of spirituality or prefer to read his thoughts cover to cover, Living with Consciousness is an enduring, comprehensive guide for anyone seeking a closer connection with mind, self, and universe. A lifetime's worth of inspiration and insights in one compact, readable book. Nozer Kanga is a lifelong student of karma, spirituality, and consciousness. His spiritual journey began in Mumbai, India, where he studied with Khorshed Bhavnagri, author of The Laws of the Spirit World. Kanga’s own book, Living with Consciousness, is the result of years of extensive research, hard-won insight, and life experience. Kanga currently resides in North Vancouver, British Columbia, Canada. Watch the book trailer . . .
An exceptional debut novel from All Things That Matter Press . . . In a contemporary world gripped by fear of international terrorism, the Boston architect Luca Leontin returns to his native Romania, where he not only confronts his past but finds himself adrift in a whirl of vengeance, loss, and passions both old and new. This haunting story of obsession and revenge is, above all, about the survival of love despite the corrosive action of lifelong mistrust and suspicion. "A brooding yet playful look at how our lives are defined by history but move along in spite of it." E. J. Bancesco, a practicing architect, is also the author of a second novel, The Scarf, recently published by Hyperborea Press. Learn how to heal your past, open your heart, and find the love relationship you've always wanted . . . When it comes to relationships, do you feel fearful, blocked, stuck, or unsuccessful? If so, then this one-stop guide to greater satisfaction with yourself and others is for you. Quite possibly the most practical, forthright—and inspiring—guide of its kind that you will ever read! Kimi Combow-Gill, a Registered Clinical Counsellor with the BC Association of Clinical Counsellors, has a private practice in Coquitlam, BC. 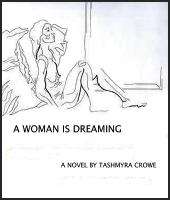 A visionary story of women—their worlds and histories, their conflicts and perils . . . In this metaphysical novel, the author dares to imagine a cosmos of women's experience and connection across time and cultures. Six women and a little girl, separated by time and space, are united in facing adversity, death, and grief. But they also share courage, resilience, and the capacity to love, heal, and ultimately to experience the joy of the spirit triumphant. Tashmyra Crowe became a traveller at an early age and, enriched by her Irish sensibility and the artistic traditions and visual poetry of Montreal, she has lived in Europe, Latin America, and Asia, as well as various places in Canada. She has focused her life primarily on the joys of being a writer, teacher, and mother. An adventure spanning two continents, and a vendetta that must end in death . . .
Scotland, 1746. Seventeen-year-old John Wallace kills a British officer in self-defence. Captured by Captain Frederick Scott, the officer’s uncle, John is swept up in the Highland clearances and exiled to the American colonies. He and Captain Scott will meet again and the blood feud that began in the hills of Scotland will play out its final act in the heart of the Canadian wilderness. George Douglas, a Vancouver, BC, writer, has travelled extensively in Scotland and North America to research the geographical and historical background for Through a Darker Eye, which launches a projected series featuring the true-to-life adventures of the Wallace brothers. A kind of death . . .
by Tami A. Reeves NEW EDITION RECENTLY RELEASED with a special Author's Note. A candid narrative of a husband torn between love for his wife, who is suffering from early-onset Alzheimer's, and the need to move on with his own life. Told by "the other woman," Bleeding Hearts breaks the silence on a sensitive subject. A tale for our times—an unusual, moving, and inspirational love story. From Inanna Publications, a powerful, award-winning story of a family torn apart by insurmountable forces . . . 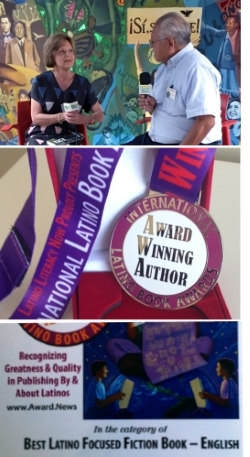 In the Belly of the Horse, by Eliana Tobias 2ND PLACE WINNER in the 2018 INTERNATIONAL LATINO BOOK AWARDS in the category of "BEST LATINO FOCUSED FICTION BOOK." In 1990s Peru, amid civil conflict and brutality, Otilia Perez is separated from her husband and seven-year-old son. She embarks on a desperate search that will take years, leading her through violence and danger and, eventually, to America, where she struggles to piece together her shattered life. "More like a true story rather than historical fiction. . . . Recommended reading for those interested in social issues such as the plight of the victims of revolutions, cover-ups by ruling dictatorships, and the search for missing loved ones." Eliana Tobias was born in Santiago, Chile, to immigrant parents who escaped the Holocaust. Her rich experience of political turmoil fueled her passion to write about the ways in which people caught in devastation rebuild their lives. A lavish and important book, revealing one man's life and art, spanning seventy-five years of Canadian culture . . .
Kevin Turner's illustrated biography not only chronicles Price's life and artistic development as a painter of weather and landscape, but also brings together a wealth of previously unpublished primary sources: exhibition mementos, press clippings, letters, Price's own recollections, and lush photographs of representative paintings. 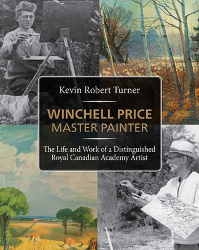 Winchell Price, Master Painter opens a window onto Canadian cultural life in the latter three-quarters of the twentieth century. A must-read for Canadian art lovers and a must-have for major libraries across Canada. Kevin Turner is a Vancouver author and retired businessman. His association with Winchell Price dates to the mid-1950s when his parents, Mel and Pearl Turner, dedicated themselves as private patrons to assisting this gifted and, at the time, struggling artist, whose works now grace museums and private collections all over the world. One man's life story—and a fresh perspective on Canadian and US history . . .
James Beaver, born in 1845, was among the first generation of his Cayuga people to be born and raised on a reservation. He was a self-made man, talented carpenter and carver, painter of folk art, and entertainer in medicine and Wild West shows. His life story helps illuminate the role that Natives played in the development of Canada and the United States. A page-turner tale of betrayal and revenge . . .
Set in modern-day Peru against a backdrop of drug cartels, shamanism, guerrilla warfare, and art crime, Fer-de-Lance is a fast-paced action/adventure thriller centered around the dangerous and conflicted lives of three strong-willed women and the men surrounding them. Graeme Wilson, a BC writer, has over his lifetime ventured to several remote and challenging destinations. He is currently working on a collection of true stories chronicling his travels. The Featured Books & Authors video series that formerly appeared on this page has been discontinued. Visit the Helping You Get Published video library for a complete list of on-site videos, including previously produced shows featuring published client books and authors and individual client book trailers. View a select bibliography of Helping You Get Published books and authors, grouped by genre . . .